Welcome to the Website for the Annotated and Indexed Bibliography of the first 30 years of The Chaucer Review. The index and an accompanying, numbered list of bibliographic entries was published as a special issue of The Chaucer Review in April, 1997. The Chaucer Review is essential reading for Chaucerians at all levels of study. More than any other resource, it provides a record of most of the significant trends in medieval and Chaucer scholarship for the past three decades. It has, however, grown so rich and full that only with difficulty can we make the best use of it. Even those of us fortunate enough to have been charter subscribers and to have our own full runs of the Journal have no ready way to know what is in the more than three linear feet of the quarterly numbers of the Chaucer journal that now occupy our shelves. The purpose of this special issue of the journal is to provide scholars with a compiled list of all of the nearly 800 articles that have appeared, and, more important, a subject index to all of those articles. Subtitled A Journal of Medieval Studies and Literary Criticism, The Chaucer Review has spoken boldly and fully and long as the prominent sounding board for scholars of medieval literature, especially Chaucerians. Fundamental as this journal is, as issue after issue has come from The Pennsylvania State University Press, finding material in The Chaucer Review has been an increasingly daunting and frustrating challenge. The staff of the journal has provided at the end of each volume a list of the articles to appear in that volume and a comprehensive list at the end of each decade, but there has been no index. The titles of the articles are some guide to the contents, but every scholar knows that the titles often contain only the most subtle hint about what the article is really about. Who would know, for example, that Jackson J. Campbell's "Polonius among the Pilgrims" (7 : 40) is about the fictional teller of the Manciple's Tale? No one has before now attempted to provide a subject-matter index of the journal. We have tried to keep the index both useful and within reasonable bounds. We have made every attempt to help scholars locate articles that may be relevant to their specific projects, but we have made no attempt to design an index that would replace the individual research that scholars working on specific problems will need to do. We have used our best judgment in selecting items to be included in the index. We have tried to guide readers to significant discussions of important topics, but have tried not to send readers scurrying after obscure or unimportant references. In constructing the index we followed the general principle that scholars most need a guide to specific works, pilgrims, authors, and concepts. We have indexed the term courtly love, for example, but not the broader term love; the term Manciple but not the terms pilgrim or relationship between tale and teller; the term Boethius but not the term philosophy; the term Knight's Tale but not the terms military conflict or consolation for death or Palamon. Whereas the bibliographies included at the end of each volume and at the end of each 10-year set of The Chaucer Review provide only the first page of each article, we have provided the inclusive pages. Whereas those bibliographies provide cumulative-year dates of the volume in which an article appeared (e.g., 1984-85), we have provided the exact year (e.g., either 1984 or 1985) of the quarterly issue in which the article appeared. We have converted the all-upper-case titles in the original articles into mixed upper-and-lower-case format. Our most crucial decision was the decision not to attempt to index the names of the characters within the various works--John, Bercilak, Alisoun, Black Knight, Beowulf, the magician, and so on. Our doing so would have added many pages to the index, but would even so have been incomplete. Would we include only major characters, or the very minor ones, as well? Would we include passing or endnote references to a given character, or only long and focused discussions? We decided, rather, to index under Pardoner's Tale every article that discusses that tale or its characters in a significant way, and leave it to individual scholars to see whether the articles listed give them the information they seek about the old man--or any other character in the tale. Our one exception was the individual Canterbury pilgrims. These characters we have included in the index. We have indexed the Canterbury pilgrims discussed in an article when we felt that the article was concerned in a significant way with the history or character of that pilgrim. We have indexed under the terms most commonly referred to by scholars: Host rather than Harry Bailly, Man of Law rather than Sergeant of Law, Friar rather than Huberd. 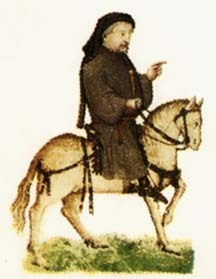 Chaucer's works are listed separately rather than under his name. The works of the better-known other medieval writers are listed under the writer's name. Other works are listed by their titles. We alphabetize an item without reference to any article--"the," "a," "le," "la," "il"--that precedes the key word. Because the bibliography, which follows the index, is organized alphabetically by the last names of the authors of the various articles, we have neither included the names of these scholars in the index nor attempted to note when a scholar was agreeing with or challenging another scholar. For articles with multiple authors, we have of course included the names of both authors, but we list them alphabetically under the name of the author given first on the article. We have cross-referenced the names of the second and third authors. In constructing the index we composed quick abstracts of each of the nearly 800 articles in this bibliography. Some scholars may find them a useful guide to what we saw as the major arguments and emphases of each article. Readers should be aware, however, that the summaries have not been "vetted," and the abstracts have not received the blessing of the scholars who wrote the articles we attempt to summarize. Still, they may be useful, especially in conjunction with the abstracts available in the annual list in Studies in the Age of Chaucer. To this end, we have decided to make them available electronically for at this site. At this site, our abstracts are listed alphabetically, and numbered by the same reference numbers as used in the printed index. Scholars may browse alphabetically through the index or use the search engine (still in progress unfortunately) to find all the occurrences of particular characters, phrases, and other key words. In the event that scholars do not have handy the index printed in The Chaucer Review, they will find it by clicking on the index link at the top of this page. Any suggestions about the construction of the website may be sent to martha.diede@northwestu.edu. We are grateful to Lehigh University and Baylor University for providing limited but important initial funding for this project, and to Northwest University for providing space on its library server for this important resource. In addition, we must thank Aaron Ensminger for his help in proofreading. We thank Amanda Bigbee for her help on the website. Mostly, however, we must thank Robert Worth Frank, Jr., who started The Chaucer Review three decades ago and who edited it until his recent retirement. Bob has shepherded two generations of Chaucer scholars--more than 550 of them--into print. No one contributing to or reading this journal can fail to be grateful to him.